We are bringing back the farm. Over the years many guests to the old restaurant were not even aware of the existence of the 1730's farm house. With the restaurant entrance at the lower part of the property along Lehnenberg Road, the parlor of the house was approached from the back and appeared to be just another dining room off the two main wings. We have brought back charm to the heart of the property, the 1730's farm house. This was the original structure on the property. One can see how the historic restaurant expanded with wings spreading from the side and back of the farmhouse. Along Lehnenburg Road one views the farmhouse entrance, where the newly restored multi-frame wood windows and shutters, return the building to the Colonial period.. Going around to the left as you face the house, one sees the event entrance. You are returning to the farm. The event entrance is through the old kitchen porch and the facade of this wing is detailed to emulate the look of a horse farm with the barn looming behind. Come around to the lawn facade and you see the barn in its full glory. It has been tucked into the existing structure and provides us with a large room for events. The crowning feature is the barn wall of windows overlooking the bucolic setting and the spring ponds cascading down the property. The event spaces at Durham Springs offer a variety of solutions. 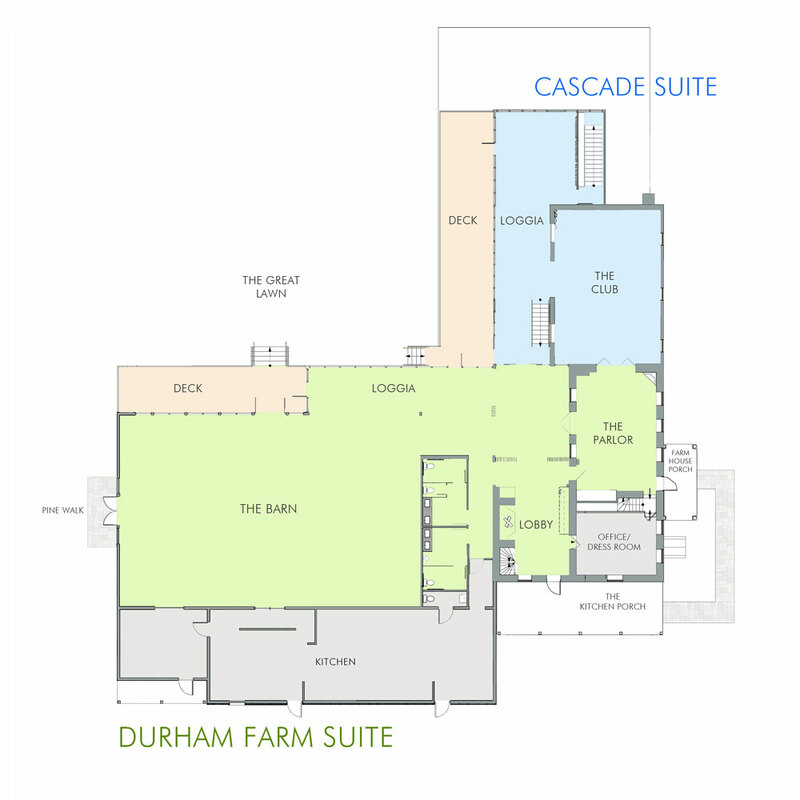 The Durham Farm Suite is available for large events, whereas, the Cascade Suite is ideal for more intimate gatherings. Separate entrances are available for each suite insuring privacy for each of the parties. The entire floor can be combined for use when the event expands to an even greater size. All of the event spaces frame a dramatic view of the great lawn and a panoramic green valley.